By Chris Williams: Leonard Ellerbe, an advisor for Floyd Mayweather, and Golden Boy Promotions CEO Richard Schaefer are saying that Bob Arum doesn’t want to put together a fight between his fighter WBO welterweight champion Manny Pacquiao and Mayweather Jr. Instead of making that fight, they see Arum avoiding the Mayweather fight to put Pacquiao back in with Juan Manuel Marquez for a fourth fight between those two guys. Schaefer also is incredibly angry that Arum prefers to put Pacquiao back in with Marquez. Schaefer says he received an email from retired judge Daniel Weinstein, who informed him that Top Rank is looking to put Pacquiao back in with Marquez in his next fight rather than setting up the Mayweather-Pacquiao fight. I really can’t blame Ellberbe and Schaefer for being upset because Mayweather-Pacquiao would be a huge fight and the fight needs to be made before boxing fans lose interest or Pacquiao gets whipped again. However, I can understand why Arum is reluctant to match Pacquiao with Mayweather. After all, once Pacquiao faces Mayweather the gravy train will be over. Pacquiao will get easily beaten and a one-sided loss to Mayweather no doubt would have a negative impact on Pacquiao’s future PPV appearances. Who would want to pay to see Pacquiao fight after he gets beaten badly by Mayweather? Pacquiao also isn’t in the position to take the Mayweather fight right now because of how badly Pacquiao was made to look by Marquez last Saturday night. Ignoring the scores, which were nothing short of a joke, Pacquiao got beat by Marquez and made to look bad. You can’t have Pacquiao moving on after a clear loss to Marquez to face an even better fighter in Mayweather. For one boxing fans won’t be as eager to see the Mayweather-Pacquiao fight now because of the controversial decision Pacquiao got over Marquez. And secondly, Pacquiao needs to prove that he can pass the Marquez test. 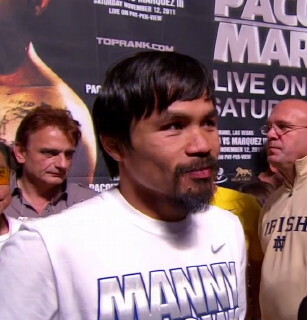 Right now, Pacquiao has lost all three fights in the minds of many boxing fans.